Featured in Dec. 2002 Powerboat magazine. Boat has Twin HP500 EFI's, ITS boxes and S/S labed props. 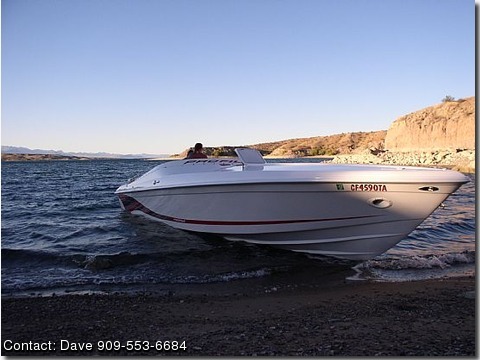 Dual battery system, battery switch, Kickhaefer 280S K-planes, Gaffing instrumentation & indicators, including GPS, Ritchie compass, depthfinder, bilge pump, AM/FM CD & XM w/remotes, electric engine hatch, McLeod interior w/electric dropout bolsters. Dino steering wheel, enclosed head w/electric sink. Tri-axle trailer with full cover, bimini top and cockpit cover.